I hate it when a sock starts to bunch up in the bottom of my shoe during a run—something that happens when it gets old and loses its elasticity. If I’m out for a short run, I won’t stop to fix it. For anything longer than 4 miles, a wrinkly sock puts you at risk of getting a nasty blister, which means it’s best to pull over and straighten things out. But what happens to that sock when you get home? After a run, I typically strip down and toss my clothes—offending sock and all—into the hamper. 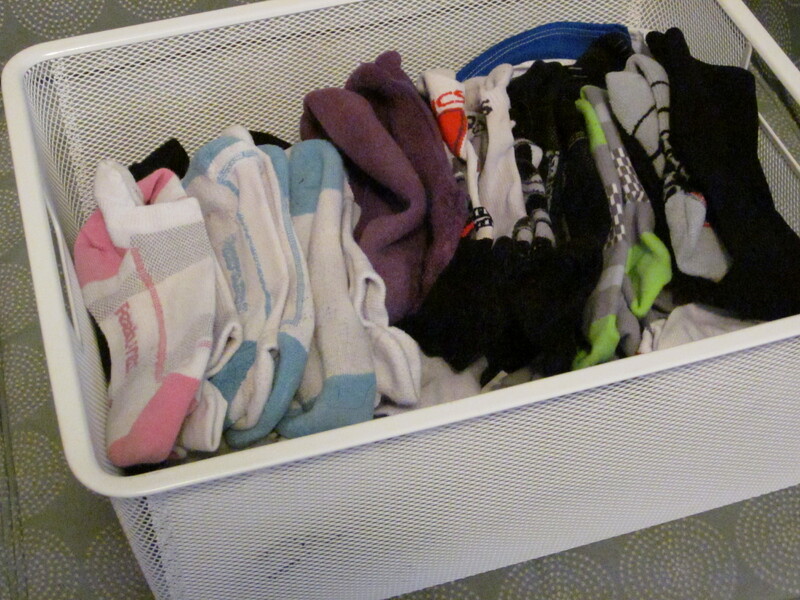 Everything gets washed later and that wimpy foot hugger ends up back in the sock bin. Since a lot of my socks look alike (I try to buy them when stores have two-for-one deals), I can’t pick out the failure just by looking at it and it manages to stay in rotation for several more weeks. This little game of sock roulette could easily be avoided if I simply threw the worn out pair into a garbage can instead of a laundry basket, but that just seems wasteful to me. Like the five pairs of past-their-prime running shoes snoozing under my couch, I want to use those old socks for lighter activities (walking the dog comes to mind), but when they’re out of sight, they’re out of mind too. What do you do with your old socks? How many pairs of retired running shoes do you have lying around? I have four retired sneakers from the gym – the “newest” old pair become my walking shoes for work. I am constantly buying socks – two for one deals ! – because I hate when they fall down too. I must have lucked out, because I have had no issue with losing elasticity in my socks (maybe because I buy those expensive Asics socks???). That being said, my socks do eventually break down in terms of holes and tears – what have you – after about 2-3 years. As for shoes… I definitely have a hard time giving up on them. I don’t buy into the “automatic” 300-500 miles and then toss idea. Still, eventually they have to go! I usually “demote” them to gym shoes or walking shoes for a few months and then I give them away to charity.